I believe that we were each created with a significant purpose and it is God alone that qualifies us. I fight the desire to be impressed with titles because I’ve seen how titles can be used by the enemy to puff us up. I have been a learner all my life, a studier of His Word and a pursuer of our Father’s heart. I believe Who we know and are known by is of far greater importance than what we know. It is the wisdom of our King that matters not the wisdom of the world. Now with that being said, I’m adding this page of certification for those who feel differently than I do. Every day we hear of a crisis or traumatic event that cripples the lives of people around us. According to the National Association for Post-Traumatic Stress Disorder, 60% of men and 50% of women will experience and suffer a horrific event in their lives. Stress disorders are the most common mental health illness affecting nearly 40 million Americans annually. It’s also estimated that over seven million adults suffer from PTSD alone in any given year. And sadly, this number includes 500,000 American veterans. Did you know that suicides among the armed forces returning from Iraq and Afghanistan are at an all-time high… and two-out-of-three military marriages are failing? Yet, we also know that during times of hardship, people are most open to change. The great paradox is that during “these times” God is not the author of evil and such horror, but He is our loving Redeemer. He uses these events and times of brokenness to reveal Himself, to let us know that His grace is always available and sufficient and that He still heals today. I myself suffered from severe depression for six years and came to know Jesus to a greater degree during that battle than any time since. He truly is close to the broken-hearted. But sometimes it takes someone else to point out this truth. God uses people who care to share His message of hope. 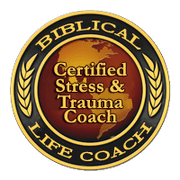 As a Family and Abundant Life Coach, my training is in Stress/Trauma care and Health/Wellness guidance. I have been certified both in CISM (immediate short-term care) and coaching (long-term care). I also have a diploma from the Institute of Nutritional Leadership. It is my sincere desire to facilitate healing through Christ for those who have endured some of the most difficult trials of life. I know that our mind, body, and spirit all need to be well for us to walk in the freedom that Christ bought for us with His blood.